Russell Osgood models his views on justice and compassion after conservative icon Edmund Burke. His adulation and respect comes from Burke’s belief that change is best accomplished by a gradual movement in structures and institutions rather than by a violent upheaval. Osgood wants to lead his own life that way. For more, read his essay from the Wall Street Journal. 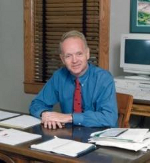 Russell Osgood was president of Grinnell College from 1998-2010. He is currently serving as Visiting Professor of Law at Washington University Law.